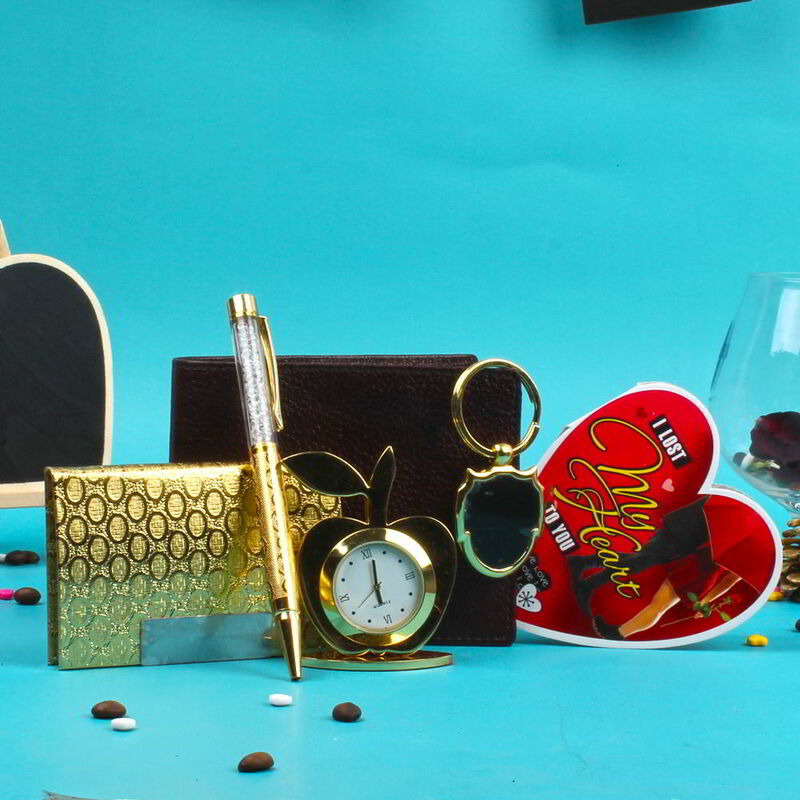 Product Consists : Gold Plated Pen, Gold Plated Apple Shaped Top Table Clock, Gold Plated Card Holder Box, Gold Plated Antique Key Chain, Men's Wallet along with Love Greeting Card. The awesome way to start up a special day of your loved ones on any occasion. 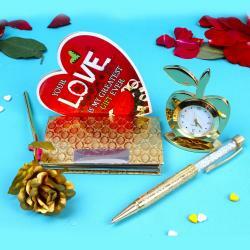 Gift your loved ones this Gold plated gift set containing a Crystal pen, Golden card holder, Golden keychain and an Apple shaped table clock. A Perfect Corporate gifting set for Boss, Employees or you can gift to your special ones on Valentine's Day, Birthday, Anniversary and for many more. 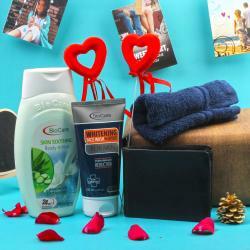 Hamper contains Wallet which is very usable gift for Mens. Pen refill ink is in blue, writes smoothly. Very elegant, royal and stylish. It adds to your personality. Whether it is peeping from your pocket or you are writing with it, you score a point while appearing for an interview. An excellent way to impress someone. A table clock apple shaped gold plated is very fashionably designed. Place it on your office table top or at Home table corner or at study table. Gold plated card holder with beautiful design. It closes automatically with a magnetic flap. Store business cards, credit cards, ATM, smart cards and many more. Keychain has a very royal look. Circle Key chain, centre space is blank; you can customise. You can place picture of your loved one on it. This gift products will definately work as a good luck charm which will bring positivity in his life. 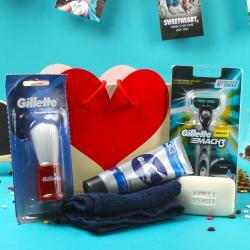 A Royal gift at an affordable price for an occasion gift like Valentine's day, Birthday, Anniversary and many more. Product Includes : Gold Plated Pen, Gold Plated Apple Shaped Top Table Clock, Gold Plated Card Holder Box, Gold Plated Antique Key Chain, Men's Wallet along with Love Greeting Card.